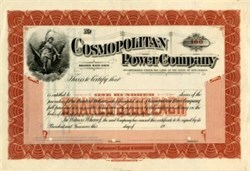 Beautifully engraved Specimen Certificate from the Cosmopolitan Power Company printed around 1900. 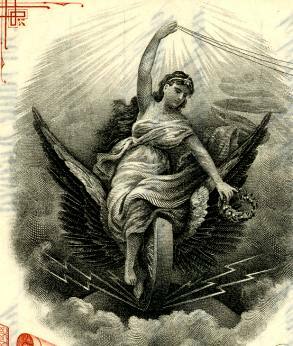 This historic document was printed by Western Bank Note Company and has an ornate border around it with a vignette of lady holding power lines in her hand. The Cosmopolitan Power Company was a corporation organized under the laws of the state of New Jersey on April 30, 1900, for the purpose of dealing in engines, machines, etc. By its charter it had power to do business in any state or territory of the United States. While it had its principal office in the state of New Jersey, located under the terms of its certificate of incorporation, it had no property in that state, and conducted its business in the state of Illinois. The capital stock of the corporation on January 1, 1902, was forty millions of dollars, of which there was ten millions outstanding. On May 13, 1902, its capital stock, pursuant to the laws of New Jersey, was reduced to $2,500,000. The company was adjudicated a bankrupt on April 23, 1903, upon an involuntary petition filed in the district court for the northern district of Illinois.